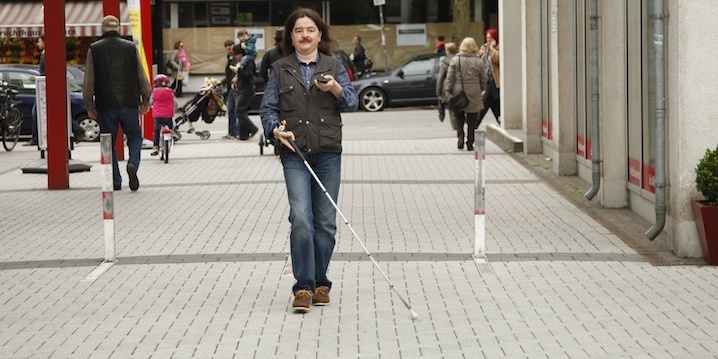 Navigation apps offer a great opportunity for blind people to use public spaces independently. Robbie Sandberg has tested and compared five iOS navigation apps. In future tests we will also cover navigation apps running on Android. This is an English translation of the German original. When the Global Positioning System (GPS) was made available for civil use in the mid-nineties, blind people immediately realised the great potential satellite-based navigation might have for them. For someone who cannot read city maps, street signs and house numbers or visually scan shops in a pedestrian area, satellite-based navigation means inclusion and independence. It is now possible to explore a city, go on a business trip or even walk the beach without being dependent on sighted assistance. To begin with however, there was a lack of accessible devices and software. The first solutions designed for blind people appeared on the market around the turn of the century. These portable devices were mostly cumbersome to operate and had to be carried by a shoulder strap or neck strap. In 2004, Loadstone GPS, the first mobile phone based solution for blind users, was developed. In the following years, further solutions became available for use on Symbian and Windows Mobile, mobile operating systems which blind users could access using speech output software. Now, in the era of the smartphone, users can choose from a wide range of navigation apps. But being spoilt for choice has its problems. Especially new smartphone users are often uncertain which app will suit them best. Some apps have been developed explicitly for blind users, others for the general public. Some announce near by points of interest (POI), others monitor crossings and house numbers, still others can guide users along a route. Some apps offer a bit of everything – but how well do they work, and how accessible are they for blind people? Ariadne offers users a quick and simple way of entering their own points of interest (POI). Favourite places and waymarks can be saved and named at will. By selecting different information fields on screen, the distance to and direction of the nearest favourite, Direction of movement, speed, GPS accuracy, etc. can be monitored. On approaching a POI, the user is automatically informed of the remaining distance and direction when the alert distance set is reached. Ariadne can also access Open Street Map data and continually announce street names and house numbers. However, this requires an internet connection. Setting and tracking personal favourites does not require internet access. Users of Loadstone, a navigation app for Symbian phones, Can import their Loadstone POI into Ariadne via iTunes. Ariadne is especially suited for outdoors navigation and determining the current position in a street. The app does not provide information on public POI and does not support turn-by-turn navigation. BlindSquare is a versatile navigation app that was designed by a blind developer. The app's own speech output informs users about near by intersections and POI. POI categories such as Food, Night Life, Outdoors and Recreation etc. can be activated or deactivated. While walking, BlindSquare announces directions of and distances to POI within the set search radius, belonging to the activated categories. Users can also call up a list of all POI of a certain category. A double tap on a POI brings up the address and telephone number or in case of a restaurant, the menu if maintained. POI can also be "tracked", meaning that direction and distance are repeatedly announced. Adding a POI to one's favourites lets the user set an individual alert distance. Every time a favourite POI is approached BlindSquare will play a sound and announce distance and direction when the set alert distance is reached. The app can also bring up a list of near by intersections or announce the current position, i.e., the current address or a close POI. The current position can be named and saved as a personal place, which may then also be tracked and added to favourites. Any POI can be simulated, allowing users to virtually explore the environment of a travel destination before hand and save certain POI as favourites. On approaching Intersections BlindSquare announces the names of the intersecting streets. However, It does not say which street is which. The current position and thus the current street can be checked by shaking the device, but in tricky situations such as a square with several intersections, it would be preferable to be informed of an intersection's layout. BlindSquare does not yet offer turn-by-turn navigation. However, the app can call up another navigation app such as Apple Maps or Google Maps in which a route from the current position to the selected POI will be calculated. BlindSquare can continue to run in the background to announce intersections, in case the navigation app used does not provide enough information. This can be very helpful, but may produce overlapping announcements, which can strongly impede articulation. BlindSquare allows users to select their native language for the speech output. Travelers can use this option to have street and place names announced in the language of their travel destination. However, distances and directions will also be announced in that language. Since BlindSquare obtaines POI data from the social network FourSquare, it works especially well in cities and areas with significant tourism. Many POI in rural areas and small towns are not yet included. Myway Classic was designed for blind users, primarily to enable the recording of routes. In recording mode, Myway Classic generates waypoints whenever the direction changes or the device is shaken. The generated route can be saved under any name and be used in both directions. The App does not use an internet connection to access map data. However, the Swiss organisation of the blind and visually impaired (Schweizerische Blinden- und Sehbehindertenverband, SBV) offers OSM files for certain regions that can be downloaded to a computer and transferred to the iPhone via iTunes. When these routes are loaded, intersections or POI can be tracked like waypoints, so Myway Classic will repeatedly announce direction and distance. It has to be said that tracking POI this way is somewhat cumbersome and is much easier to do using BlindSquare. However, for users without an internet flatrate or whishing to avoid horrendous roaming charges abroad, Myway Classic is a low-cost alternative. Myway Classic is primarily useful for recording routes, for example, when walking a new route with a sighted friend, or to record and re-trace one's own routes in unmapped terrain. the Maps app which comes with iOS is largely accessible and offers turn-by-turn navigation for pedestrians. When calculating a new route, a drive route is selected by default, even if the prefered mode is set to "walk". The pedestrian route must be selected each time. Saved routes keep the selected mode. It is relatively easy to search for POI and addresses. Used routes are saved so they can be reactivated any time. Start and end location of saved routes cannot be swapped. Strangely, this option is only available in the search mask where the user can manually enter the start and end location. It is however possible to calculate a route from the current location to a previously visited location. Turn-by-turn directions are given by the voice of the language selected for the iPhone, which blind users know as VoiceOver. Consequently the directions are not clearly distinct from other iPhone announcements. The app first indecates in which cardinal direction and in which street to begin the route. It is advisable to check the current heading using the compass app that comes with iOS. If Compass is used while navigating on a route, the calculated route remains activated in Maps when the app is temporarily closed. The compass function integrated in Maps is unfortunately not available in navigation mode. Maps announces changes of direction giving the distance to walk and the name of the street to turn into. Side streets are not announced. The distance information is welcome, but blind users will find the app wanting information on side streets and the layout of intersections. When selecting the tracking mode with heading, VoiceOver announces street names and intersections while walking, but unfortunately this mode is not available during turn-by-turn navigation. For blind users, a combination of turn-by-turn and with heading would be desirable. Another welcome feature is the off track warning. When leaving an active route, the app advises the user to turn around. A new route is calculated only if the warning is ignored. For an active route, a route description can be called up, which includes a list of streets and the corresponding distances. This allows a virtual exploration of the route before actually hitting the road. Unfortunately the display can be rather confusing. In order to access information fields and buttons, the user must swipe through near by POI and streets which are continnuously updated and displayed. Also, in the tested version the End button is not always accessible with VoiceOver. If this happens, the app must be closed in the app switcher to end navigation. Apple maps is suitable to blind users for virtual exploration of routes and is helpful when navigating. However it is far from offering the detailed information and usability blind people require. Google Maps is a largely accessible navigation app offering turn-by-turn navigation for pedestrians. It is easy to search for POI or addresses and set these as start or end locations of a route. Start and end can be swapped on demand. Unfortunately, the history of used routes is only saved if the user has signed into the app using a Google account. In that case, past routes can easily be called up. The route default screen shows public transport stops in the vicinity which can be selected as route destinations. The App's own speech output informs users which cardinal direction to begin a route in. The current heading can be checked before hand but also during navigation, using the compass app built into iOS. The active route will remain activated in Google Maps if it is temporarily closed. The compass mode within Google. Maps is regretably without effect in navigation mode. The street in whhich to begin a route is not always announced. It was impossible to determine what causes the announcement to be made or not. There is no announcement of side street crossings and distances. For blind users, who cannot read street signs or visually scan their environment, the information is frequently insufficient. Streets and corresponding distances belonging to an active route can be inspected in a step-by-step list. This allows an exploration of routes prior to navigating on them. Google Maps does not give a verbal off-track warning when a route is left. The app simply calculates a new route at some point. While the route is updated in the route overview on screen, there is no verbal indication that the original route has in fact been changed. This can make for lengthy walks if a route is begun in the wrong direction. Puzzlingly, each announcement of a turn is followed by a short vibration which does not serve any apparent purpose. A vibration alert before an upcoming announcement would make more sense. Google Maps can serve as a navigation aide but falls short of expectations of blind users who need more detailed information. The Turn-by-turn guide seems half-baked at this point. Google advise users that the guide is a beta version. POI (point of interest): A place of public or private interest such as a cash machine, a pharmacy, or a personal meeting point. "Where-am-I" function: The app returns the current address and possibly, the nearest POI>. Look-around function: The app returns the direction of and the distance to POI in the vicinity. Turn-by-turn navigation: The app gives directions according to a calculated route via integrated speech output and the display. Active route: A route for which the navigation mode of the app is active. "Off track" warning: An indication that the user has left an active route. Route recording: Recording an individual route while walking, in order to use turn-by-turn navigation at a later time. Please let me know of any review of research on the latest navigation apps for blind or visually impaired users. we recently pubished a review of the ViaOpta Nav app for iOS and Android and another one of Navigon Europe and Navigon Urban for iOS, but the texts are in German. Unfortunately we do not have the resources to translate everything we write. Maybe Google translate wil help to get the gist of the article?